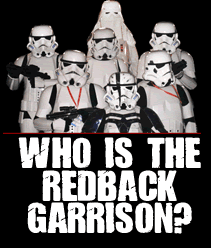 A video of the mighty Redback Garrison, crossing the finish line after an arduous 10km for the Bridge to Brisbane fun run. This entry was posted on Friday, September 3rd, 2010 at 10:59 pm	and is filed under Uncategorized. You can follow any responses to this entry through the RSS 2.0 feed. Both comments and pings are currently closed.